What is the difference between Moz Domain and Google PageRank? If not than today I will tell you the difference between Moz domain authority and Google PageRank. The both are search engine metrics. Moz formerly known as SEEOMoz but now it is better known with Moz only. 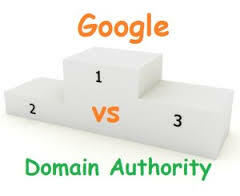 Now the question arrise what is Domain Authority (DA) and what is PageRank (PR). This post is related that how the Moz is different from PageRank. Below I have discuss some of the points which included the intro of Google PageRank and Moz DA also the differences them. As we all know that Google PageRank is rolled out in every year. This will tell you that where your site and blog stand. Google PageRank ranked your blog from 0-10. It will shows the popularity of your blog. It mostly depend on the number of nofollow and dofollow backlinks. Moz Domain Authority (DA) tell you the condition and lifetime popularity of your blog and website. It depend on some circumstances which shows how your website will stand in Google search results. It is measured on the scale of 100 and it is updated frequently once or twice in every month. Well, now in this paragraph I will tell some of the major differences between Google PageRank and Moz Domain Authority. These are the two Important metrics which is based on open site explorer. First we talk about Moz DA. It is concerned that how your blog will perform in Google search engine results. Domain Authority is measure on the scale of 100. It is calculated on basis of Linking Root Domains, Total Links, Moz Rank etc. It is automatically picked up an webpage of your site and check the probability that where it rank in SERP's. Open site explorer updated time to time. Now lets talk about Google PageRank. I think everyone is very much aware with Google PageRank. There is no need to give the entire description of PageRank because who are engage in the blogging field they are much aware with Google PageRank but those who are not know much about it than you don't need to worry , here i will tell you something about Google PageRank. Google PageRank is updated 4 times a year. Pagerank is one of the factor among Google 200 ranking factors. It rated the blogs and website from 0-10. And Google rates itself as 9. It is based on nofollow and dofollow backlinks. After discuss all the points, I think Page Authority is not already the more useful metric than Domain Authority. But don't forget the PageRank it is as important as DA. What do you think about these two metrics. Special thanks to my brothers blog "Blogging Ways" for the source.